Jorg Bruening took this photo of BOEDC’s 10,000 sqft. 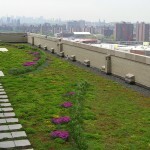 green roof in May 2008, 2 years after it was installed. Although, it seems to be at its peak beauty in full bloom in the summer, the green roof performs its environmental duties all year round. Designed by Green Roof Service, LLC. This post was submitted by Christina Ficicchia. Very elegant design and very well manicured. Excellent photo. I enjoy the green roof surrounded by the tall buildings of urban life. I was there two years ago for the installation reception/tour. The plants are beautiful and well cared for, but it’s the Wonderful Bronx Skyline that makes this pic a must for the BCEQ Calendar. Let’s continue to track this GreenRoof’s succession over the years. Photos of it can be taken in any month for variation. How’s the one on St.Simon’s looking these days? How about a photo of the scar on Vannie taken from Google Earth? This is great. Use it. Please add more pictures to see how the green roof develops over the years. Good idea Jorg, thanks. We did not know how to get in touch, but your photo is in the calendar. We never thought about using the same photo every couple of years, but it is a good idea, especially for the green roofs.